Don't keep it a secret Rick. Where did you get the nice silver one from ? Well, Uncle Jim, you ask about the nice silver one, knowing you, "you ain't seen nothing yet!" Hold on a minute, got something else that goes with that nice silver one! The download is on this site's library. 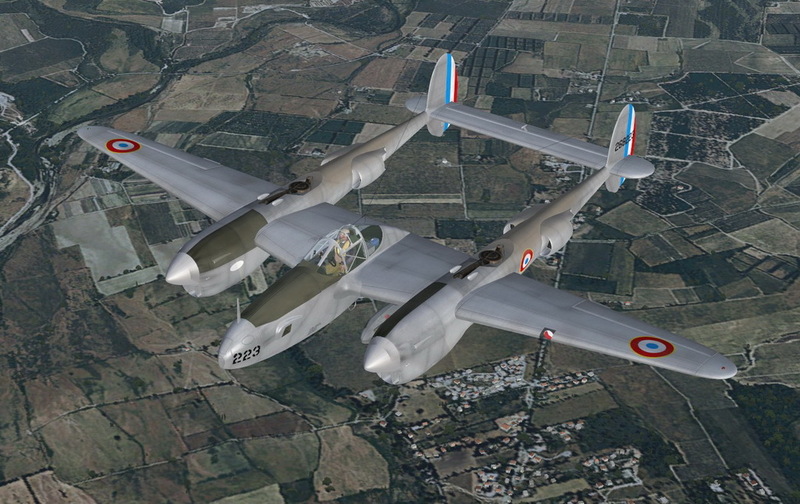 I did a search for FS2004 warbirds, Lockheed P-38, file name is p38tdl24.zip. Go get it and I will email you with some info on this. Oh, check out the above pic! I know you are crazy into red spinners, how about this one? Thanks Khalid! Flies great and awesome engine sounds. David - Everything work out for you? Thanks Rick, it installed real easy. Hi Rick. Still need to work on it. I will keep you posted! FS painter at the Hangar. you'll find all my repaints here. Happiness is a silver airplane with red spinners ! Last edited by GBJim; 02-12-2019 at 07:20 PM. Uncle Jim - That P-38 looks so nice over New York. And look how those red spinners stand out! Thanks Rick. The spinner ; makes it a winner ! Last edited by GBJim; 02-13-2019 at 10:24 PM.